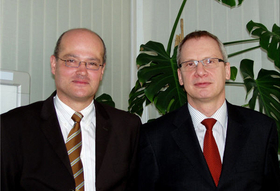 Former Wagon directors Kress (left) and Bender have created a new company, Waldaschaff Automotive. Two Wagon Automotive executives have taken control of one of the bankrupt supplier's factories in Germany. Wagon Automotive's former finance head Hans-Dieter Kress and Helge Bender, one of the supplier's directors, have formed a new company called Waldaschaff Automotive. It will take over the operations of the former Wagon Automotive factory in Waldaschaff near Frankfurt, effective March 1. Waldaschaff Automotive will continue to develop and produce door systems and vehicle body structures at the Waldaschaff site. The new management also plans to create new products that will assist carmakers' efforts to build more lightweight cars. Car manufacturers have supported the creation of Waldaschaff Automotive. "The carmakers promised us that we can transfer orders to the new company and that all invoices will be paid without deductions," Hans-Dieter Kress told Automotive News Europe. Kress said the key customers are Ford Motor, Audi, Daimler and Volkswagen. Waldaschaff was one of 19 factories belonging to UK-based Wagon Automotive PLC, which filed for bankruptcy in the UK last December. The company ran into trouble when car sales fell and car companies reduced their orders. Under the German holding of Wagon Automotive there are also factories in Nagold and Ingolstadt which are not insolvent. It is not clear yet what will happen to those plants, said Franz-Josef Hansen, Wagon's insolvency administrator.